Rich textures and colors give a vibrant feel to this rural scene. 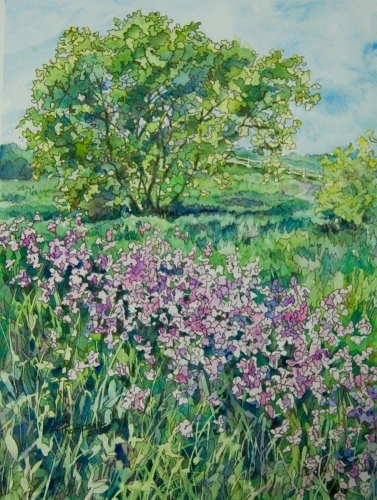 Watercolor & India Ink on Paper Cool shade on a hot day. 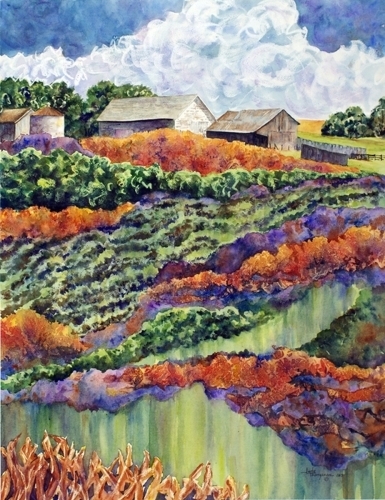 This painting was inspired by a 104 degree day out on the Nebraska prairie. 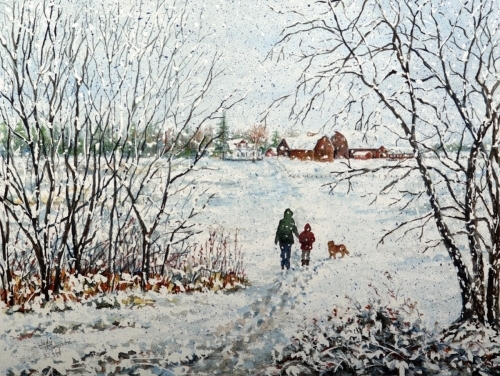 Available at Lanesboro Arts, Lanesboro, MN. 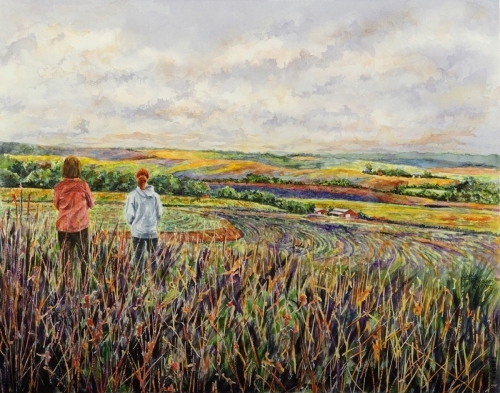 Contact gallery through link on Purchase Page. 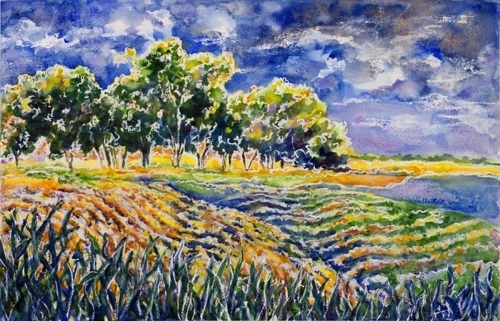 This spring scene captures the breeze through the prairie grasses. Available at Lanesboro Arts, Lanesboro, MN. Gallery contact information can be found on Purchase Page (above). 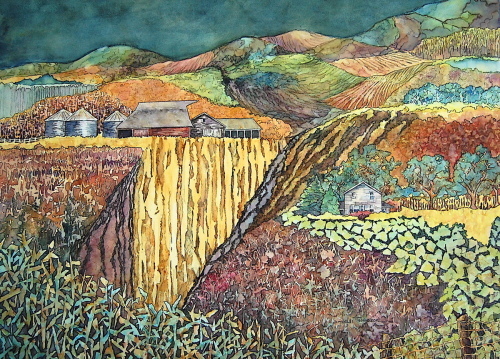 a visual feast to this rural scene. 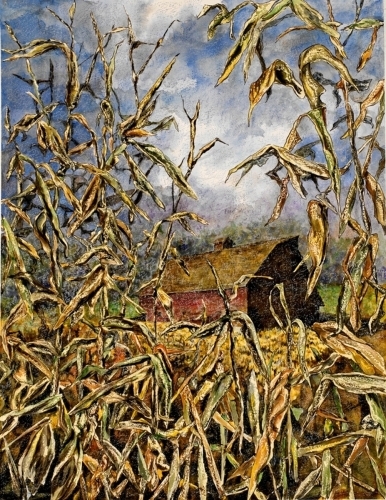 This bright red barn peeking through the corn brings a sense of hope and safety. 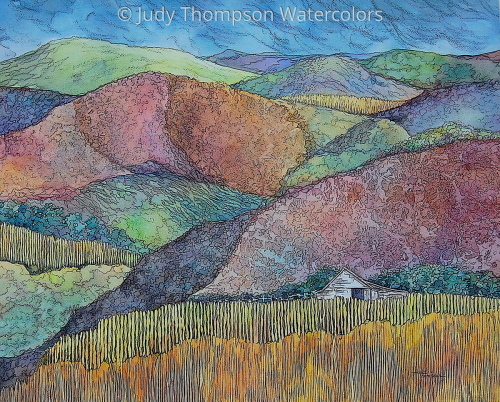 Wax crayon and ink provides an earthy granular texture. Artwork shipped without frame or glass. Matting is included. The red gate in the foreground points to a beautiful, peaceful vista full of hope and promise. 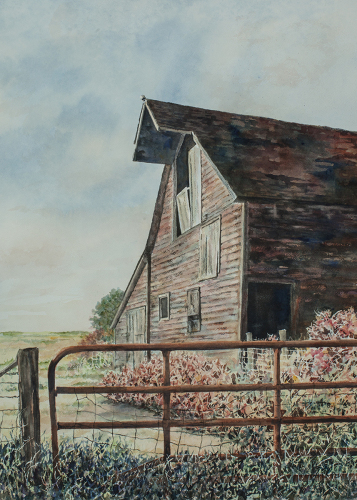 Looking up to bright skies, this old barn offers the viewer new perspectives. A warm farmhouse awaits these winter trekkers making their way back home. 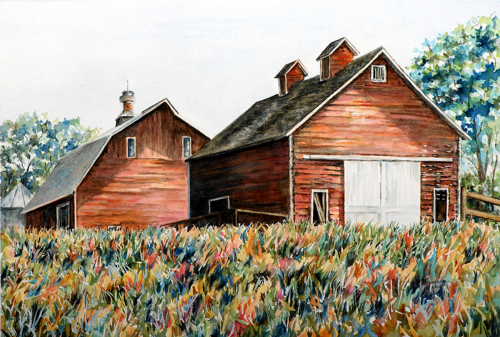 Geometric shapes play the starring role in this bold barn painting. 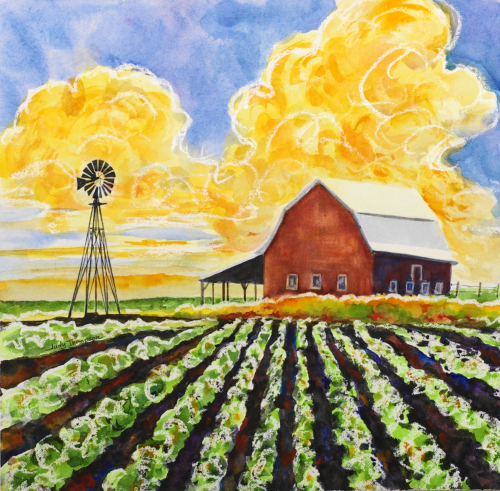 This bright and cheerful scene is reminisce of a sunny, breezy day in Iowa. Modeling paste was used on the surface to capture the windy highlights and to create a raised, relief-type texture. An iconic scene of the Western range. Mixed Medial on Board. Varnished. Triptych. No additional framing needed. 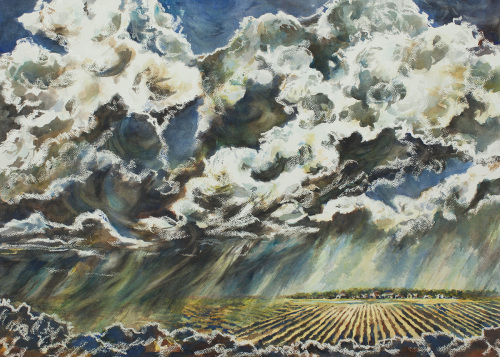 This large and inviting piece beckons us into the fresh, windswept prairie with its soft greens and turquoise blues. 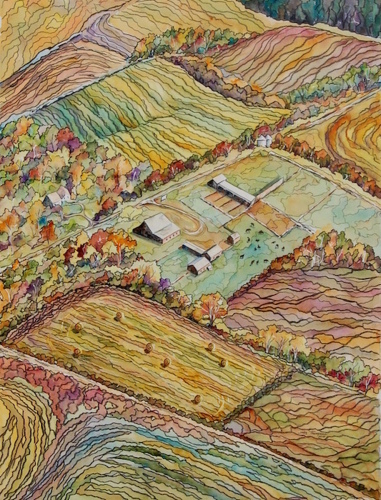 This commissioned artwork was drawn from an aerial photograph of a family farm. 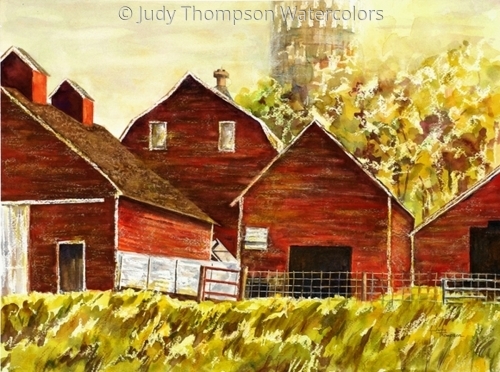 Using a charcoal pencil, shapes were outlined in this charming, but earthy, farm scape. 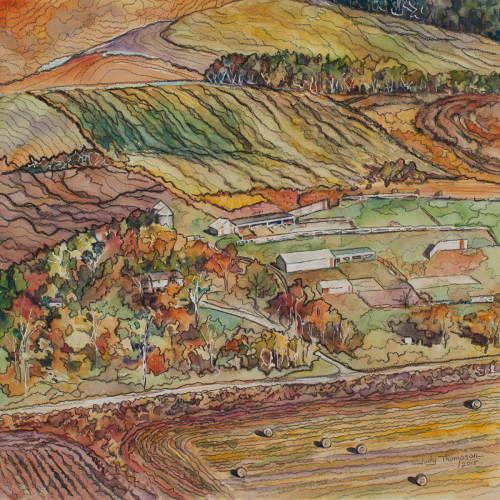 An aerial perspective creates a new view of a familiar rural scene. Basking in the Iowa sun. 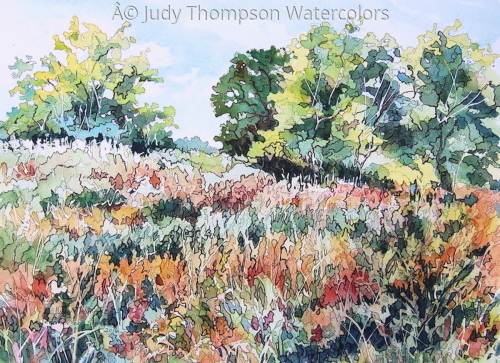 An autumn hike in the afternoon sun inspired this peaceful prairie scene. 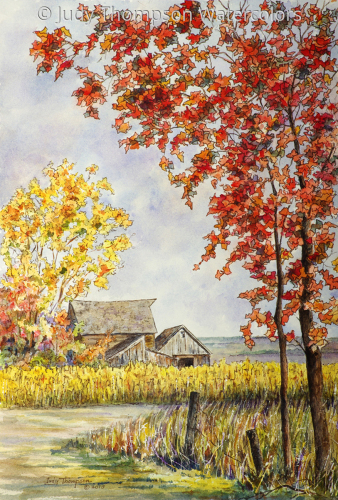 The violet tinted sky allows the yellows and reds to sing their October song. Line and shape dance together to a summer melody. Morning arrives in soft yellows and turquoise. 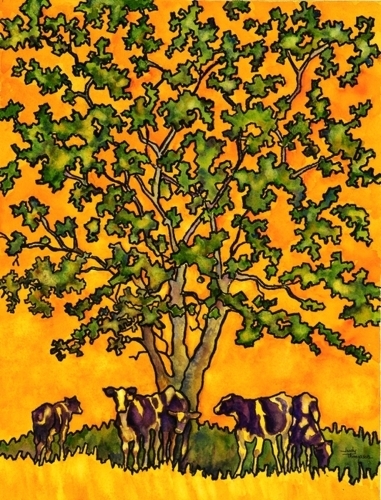 This fun piece of artwork was commissioned by a husband as a gift to his cow-loving wife. 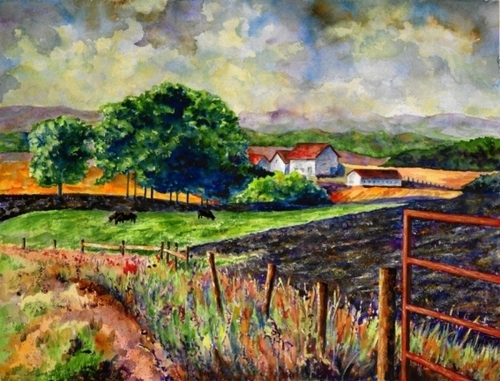 A distant farmstead provides a safe haven during a sudden summer storm. 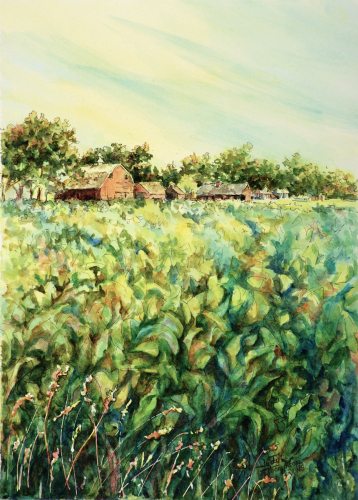 Inspired by a hike with family and friends, this watercolor contemplates the beauty of the prairie farmland. 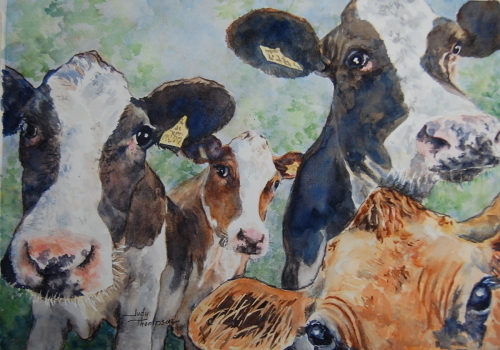 Sorting through this herd of cows provides a visual puzzle of mingling black and white shapes. 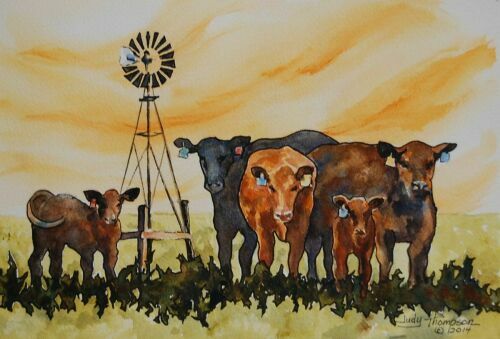 This commissioned artwork features the angus cattle, the dependable pick-up and tractor, and the beloved dog.